Elizabeth “Betsy” Smith was appointed President & CEO effective March 1, 2018. In her role, she directs the overall strategic planning, park operations, capital programming, public programming, development, and communications strategies for the organization. Ms. Smith works with the Board of Trustees on all governance issues, board development, financial planning, and budgeting strategy to ensure a strong, stable organization. 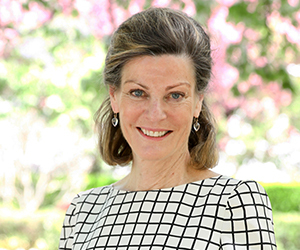 She has executive responsibility for fostering relationships with donors at all levels, Park users, senior NYC Parks officials, and other public officials, while providing leadership to all levels of the organization. Prior to her appointment as President & CEO, Ms. Smith sat on the Board of the Conservancy and the Advisory Board of the Institute for Urban Parks. She previously served as NYC Parks Assistant Commissioner during the Bloomberg Administration, where she was responsible for the Agency’s large and highly diversified concession portfolio, all major special events on City parkland, and managing relationships with an expanding portfolio of conservancies and other public-private partnerships. An avid supporter of urban parks and open space, she also has served as a Board Member of Friends of the High Line and the Open Space Institute, and as Vice Chair of New Yorkers for Parks. Prior to joining NYC Parks, Ms. Smith had a 25-year career in finance. She started in commercial banking at JP Morgan before transitioning to venture capital and private equity management at Prospect Group Inc. and at the family offices of Harry F. Oppenheimer and the Rockefeller Financial Group. She later ran client services and finance at Sotheby’s. Ms. Smith is the Chair of the Board of the Library of America, a nonprofit publisher of significant American writing. Ms. Smith has two daughters and lives in New York City with her husband, Rick Cotton.